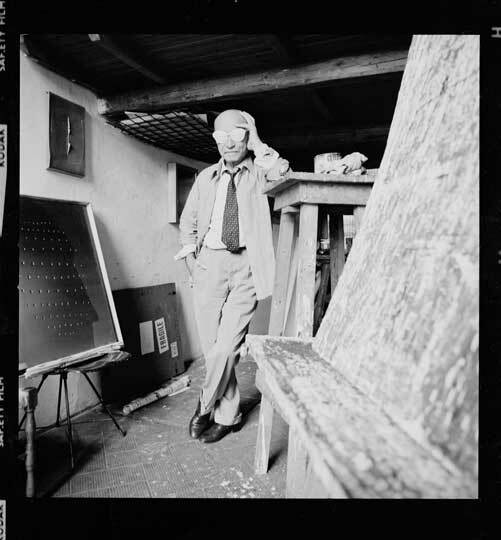 On the night before the press opening of this major retrospective of the Italian Argentine artist Lucio Fontana, there was a party in the Paris gallery of Tornabuoni Art, leading dealers in the artist. 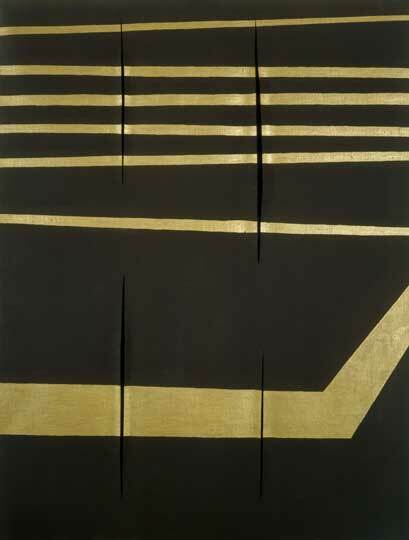 Half way through a celebratory dinner, a marvellous black and white documentary film from 1962 was projected onto the wall, showing Lucio Fontana with characteristic theatricality puncturing his friend Jef Verheyen’s monochrome gold painting, Le Jour. The interviewer was reverential and the artists comically grave. 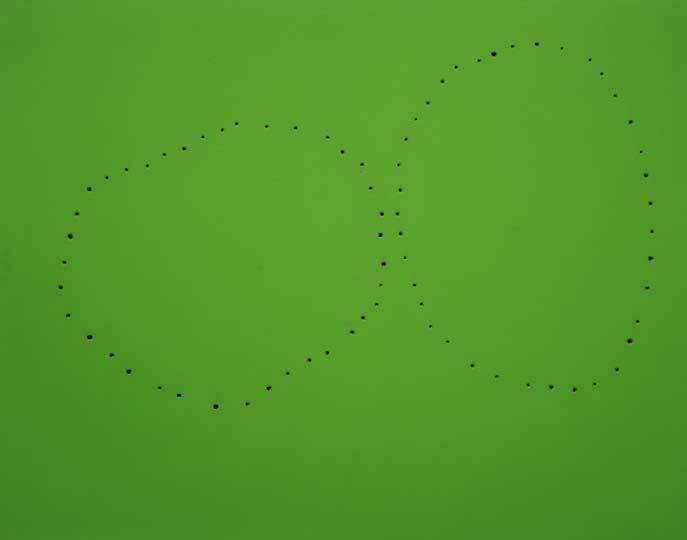 Fontana recounted how he had hit upon the idea of puncturing the picture plane in 1949, and how this had opened up the dimension of space in his painting and of outer space in his imagination. 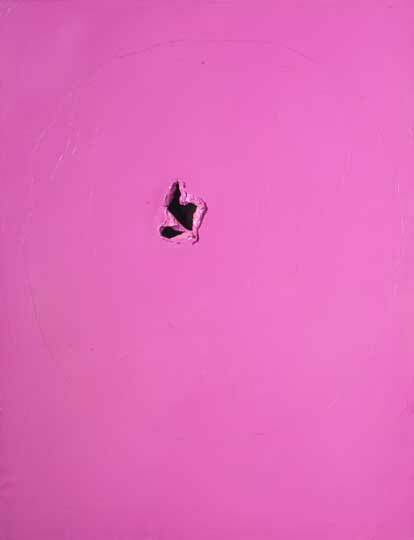 There, on the wall opposite us, hung the canvas itself, punctured with an elegant spiral of holes, part of the exhibition ‘Lucio Fontana: Rediscovery of a Masterpiece’ (open until 21 June). The whole event seemed faintly ludicrous. How, I wondered, could everyone take these art works so seriously? Once you have punctured one canvas, what can you gain, conceptually, from puncturing another? For today it seems they have become no more than a multi million pound must-have for every aspiring modern and post-war collector. 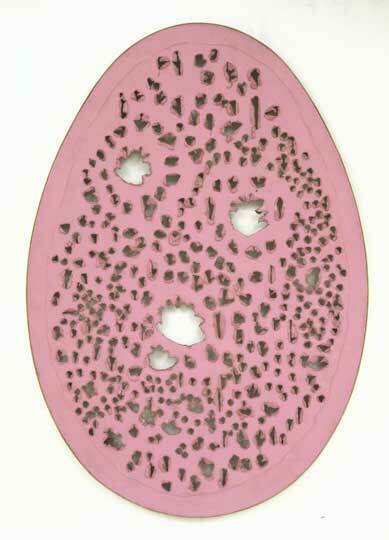 La Fine di Dio (1963), a gilded pink egg-shaped canvas with large torn holes, realised $20,885,000 at Christie’s New York last November. The exhibition at the Musée d’Art Moderne however (his first major retrospective in France since 1987), is a bracing antidote to such art-world fatigue. 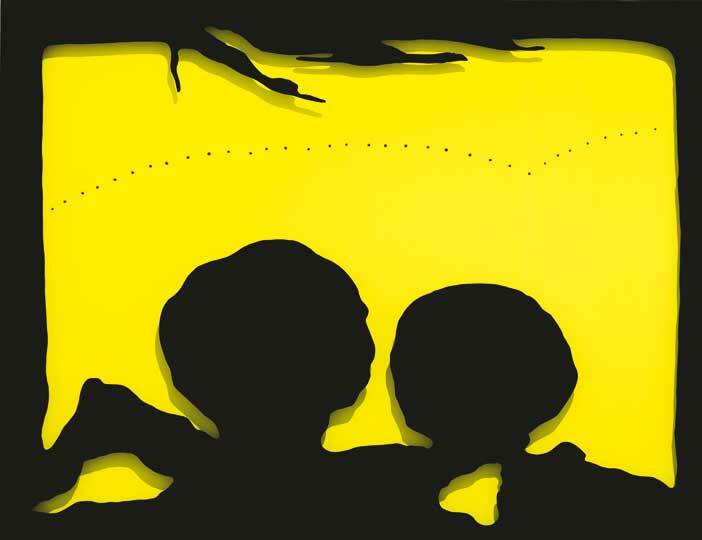 At the entrance to the exhibition is a giant neon installation, first made in 1951 and reconstructed for this occasion – a joyful, graphic scribble of light. The curator says that although it is futile to argue about precedence, Fontana was experimenting with neon well before Dan Flavin. And it is Fontana’s lifelong appetite for experiment, his commitment to a continually unfolding creative project, that is the animating thread of this exhibition. There is one immaculate red canvas with a perfect slit (in the ‘60s he was making 150 similar works a year) but otherwise what we see is an artist trying out new ideas, new materials, new techniques, all the time. 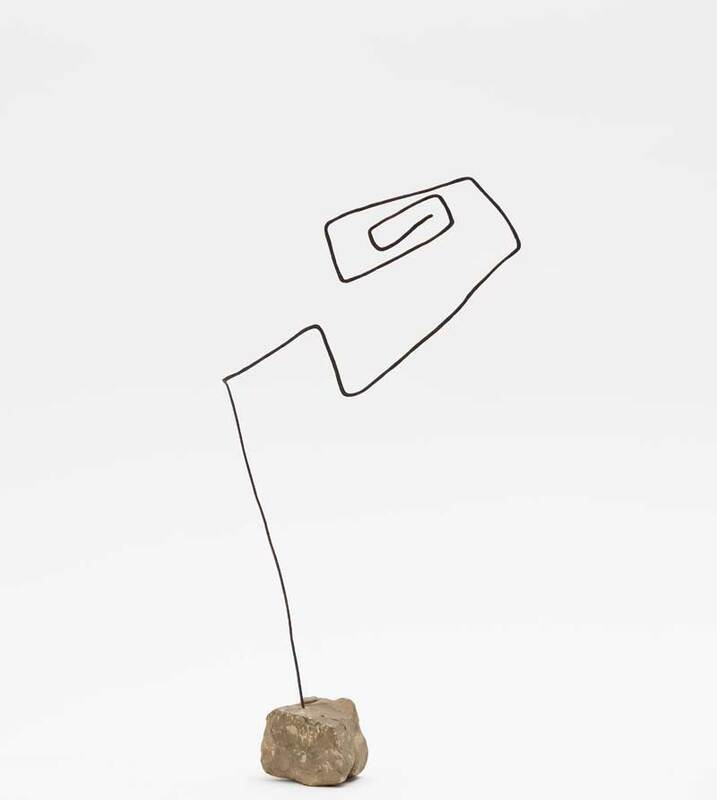 After some truly awful early figurative sculpture (Fontana learned his father’s trade as a sculptor of graveyard memorials), there is a cabinet of small abstract sculptures from the 1930s, which, with a twist of wire or incline of a cement plane, deftly animate the space around them. Alongside these, vivid, tactile, polychrome ceramics, both abstract and figurative, remind us that however much we may think of Fontana in terms of his canvases, for much of his career he maintained a parallel strand of experimentation in clay. Indeed, Fontana’s first foray into ‘Lo Spazialisme’, the art movement he founded, was a ceramic cube, Ceramica spaziale (1949), exhibited here. This was his annus mirabilis. That same year he also created L’Ambiente spaziale a luce nera, a darkened room in which papier mâché shapes, painted in fluorescent colours, are suspended and lit from above – Fontana’s first environment. 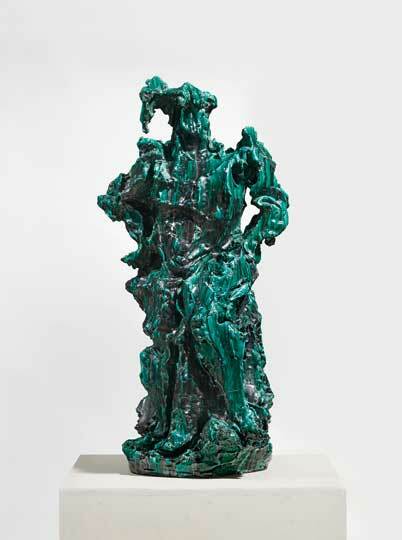 By this time Fontana had returned to Italy from wartime exile in Argentina, and while his ceramics reached a peak of baroque exuberance, combining kitsch with Bernini to give the material a new anarchic life, 1949 also saw Fontana’s first pierced works on paper and canvas; Concetto spaziale (1949) and Concetto spaziale (1949/50). In context, you register the visceral, violent shock of the action: on the one hand, by piercing the picture plane, the metaphysical realm behind the world of illusion streams through; on the other, the picture becomes a sculpture, in the world, rather than a world in itself. From now on, although there would be forays into ceramic sculpture, architecture and installation, it was the picture plane that most stimulated Fontana’s imagination. Whether slashed or painted, studded with stones or sprinkled with diamond dust, constructed from paper, canvas or even metal, always curious and questioning, it was here that Fontana could explore most intimately the borderlands of truth and illusion, this world and whatever lies beyond. I left chastened. In his dapper clothes and with his charming smile, Fontana knew what he was about: the slickly painted slits were just a feint, a means of funding this far more urgent, unrelenting endeavour. 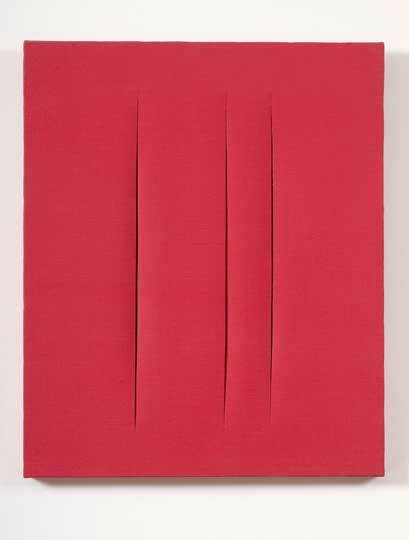 ‘Lucio Fontana: Retrospective’ is at the Musée d’Art Moderne de la Ville de Paris until 24 August. Not to nitpick, but Dan Flavin worked with commercially available fluorescent light tubes, not specially fabricated neon.